You can adjust text in a text box, shape, table cell, row, or column so that it’s aligned to the left or right border, centered, or aligned on both left and right (justified). You can also change the vertical alignment, adjust line spacing, set the text margins, and change the number of columns in a shape or text box. You can use tab stops to align text. When you press the Tab key (or Option-Tab when you’re working in a table cell), the insertion point and any text to the right of it move to the next tab stop, and text you enter starts at that point. Select the text box, shape, table cell, row, or column. In the Text pane of the Format inspector, click Style, then click the alignment buttons you want. You can adjust the spacing between lines of text and change the amount of space before or after a paragraph. 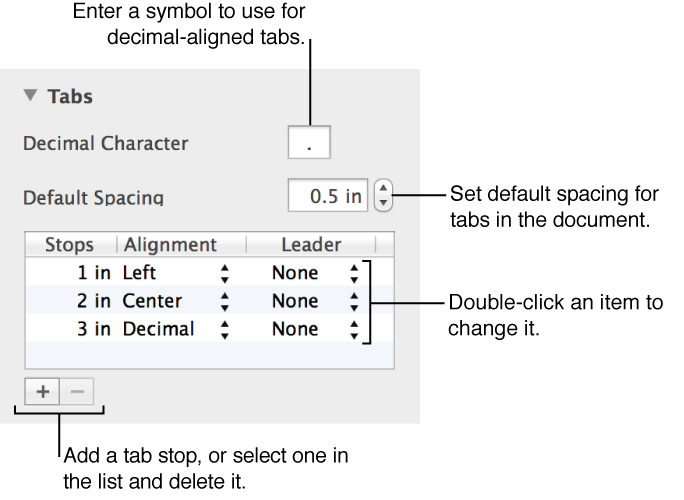 Select the text box, shape, table cell, table row, or table column whose spacing you want to change. You can also select specific text. In the Text pane of the Format inspector, click Style. Lines: Choose when the distance between ascenders (parts of letters that extend to the top of the line) and descenders (parts of letters that extend below the line) should stay the same. The space between lines is proportional to the font size. At least: Choose when the distance between lines should remain fixed (but not to overlap if the text gets large).The distance from one line to the next will never be less than the value you set, but it may be larger for larger fonts to prevent overlapping text lines. Exactly: The distance between the baselines. Between: The value you set increases the space between the lines, instead of increasing the height of the lines. By contrast, double-spacing doubles the height of each line. Click the arrows next to the spacing field to set the amount of space for the option you chose. To set paragraph margins, the rulers must be showing. If you don’t see rulers, click View in the toolbar, then choose Show Rulers. Click in a paragraph, or select one or more paragraphs. Drag the margin and paragraph indent markers (in the top ruler) to where you want them. To use default indents, which increase or decrease the indent of an entire paragraph, click one of the indent buttons in the Text pane of the Format inspector (you may have to click the Style button near the top of the pane to see the alignment buttons). You can change default paragraph indents in the Text pane of the Format inspector. Click Layout, then click the disclosure triangle next to Indents. You can change the number of columns in a shape or text box. In the Text pane of the Format inspector, click Layout, then click the disclosure triangle next to Columns. Click or select the paragraphs where you want to set tab stops. Click the ruler where you want to place a tab stop. 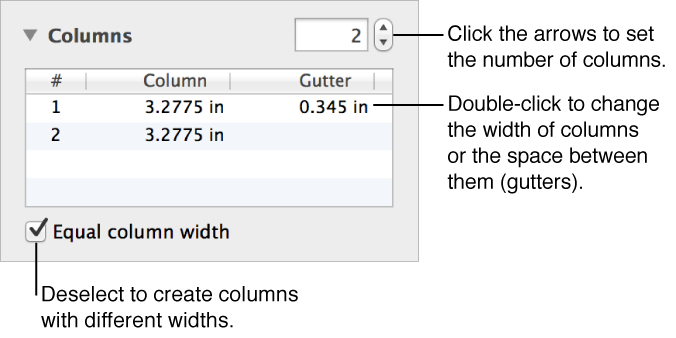 If you don’t see the ruler at the top of the spreadsheet, click View in the toolbar, then choose Show Rulers. To change the tab stop alignment, Control-click the tab stop icon, then choose the alignment you want (Left Tab, Center Tab, Right Tab, or Decimal Tab). To change the position of the tab stop, drag its icon along the ruler. You can also change other tab settings, including the default tab spacing. In the Text pane of the Format inspector, click the Layout button, then use the controls in the Tabs section to make changes. To remove a tab stop, drag the tab stop icon below the ruler until it disappears.